Street food from Berlin is featured in the chintzy Chef's latest post. I am a sucker for sausage. If you liked my sidewalk vendor L.A. Street Hot Dog video and recipe (click here), then achtung to the Billig Koch's latest dish -- Berlin's most popular street corner fast food, Currywurst. It's simply a grilled, or fried, German sausage (usually bratwurst) that is sliced, then drenched in an amped-up ketchup and curry sauce, with bread (or Belgian fries) on the side. The sausage is sliced and eaten with toothpicks instead of a fork -- this is curbside dining at its most primitive. Currywurst came about after WWII, at a street stand in the Berlin district of Charlottenburg. An enterprising fraulein, Herta Heuwer, combined the American infantry's love of ketchup with the British soldiers' curry fixation and added German bratwurst to create a dish that became an instant hit with the local populace as well. Click here for a look at some well-known Berlin Currywurst spots, and here for more historic details. 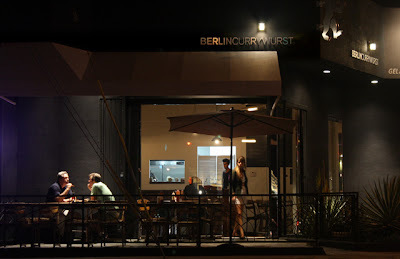 I'd never heard of this treat until five months ago, when Cuirrywurst came to Silverlake. During my nighttime outings photographing L.A.'s restaurant facades, I ventured into Berlin Currywurst on Sunset Boulevard. It's a sleek but simple eatery, all glass window walls and a few outside tables. And the menu is just Currywurst, bread and Belgian fries. You do get to choose from several bratwursts for $5.89 each -- like Bockwurst (veal and pork), Rindswurst (beef), Geflugelbratwurst (chicken) and, this being Silverlake, Tofu-Bratwurst or Tofu-Kielbasa. I tried the Paprikawurst, which is spiced and garlic flavored. The sausages are made locally and have a rougher texture than store bought wieners. You can read their complete menu online here. 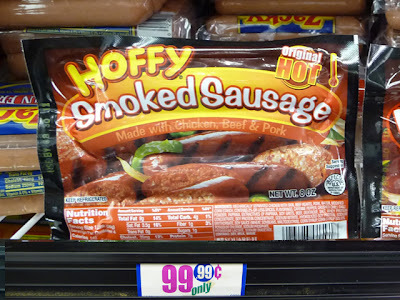 Earlier this week I noticed my local 99c only Store is stocking an interesting variety of sausages made by Hoffy, including Louisiana Hot Links, Chorizo and Spicy. You get four large hot dog sized links per package. A good deal -- not bratwurst, but not bad. Of course you can use your favorite German deli sausage. The unique part of this recipe is the Curry Sauce. There are many variations, of course. In Berlin you can buy bottles of the stuff, and every street stall has its own curry sauce blend. 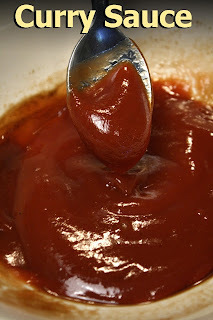 I 'm keeping it simple and old school -- with the dollar store ingredients of ketchup, Worchestershire sauce and ground cumin. 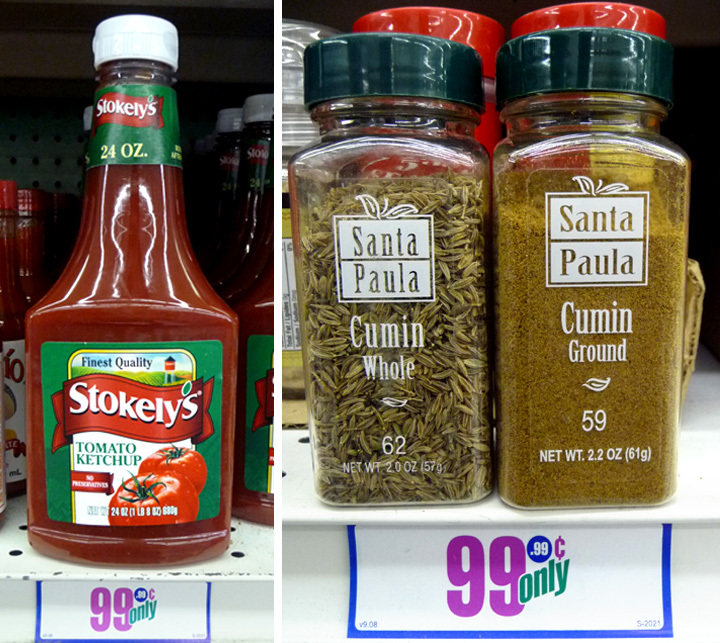 Curry powder is harder to find, but ground cumin is 80% there. And, I also have a great side recipe of Belgian Fries here. 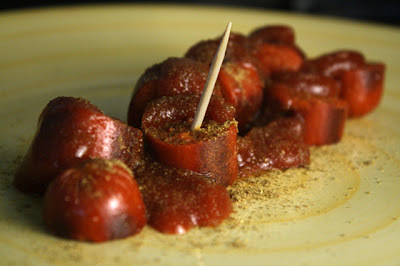 Der Neunundneunzig Cent Koch loves street food, and my version of Currywurst is beste Sachen -- Guten Appetit! But beware, this recipe is addicting, I've made it three times this week! Click on any italicized German word to see translation. 1 sausage link - bratwurst or your favorite sausage. 1 1/2 teaspoons of ground cumin, or curry powder - teaspoon for sauce and 1/2 tsp. for serving plate. 1 teaspoon oil for sausage frying. Salt & pepper to taste - for sauce. 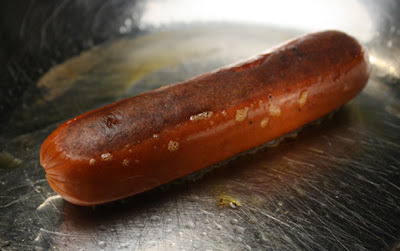 Add a teaspoon of oil to a heating pan, and simply fry sausage link to desired doneness. Since it's summer you can cook it on a BBQ grill, too. In another small pot add ketchup, Worcestershire sauce and a teaspoon of ground cumin (or curry powder). Salt and pepper to taste - a dash of Cayenne pepper is optional. Mix well and heat through. 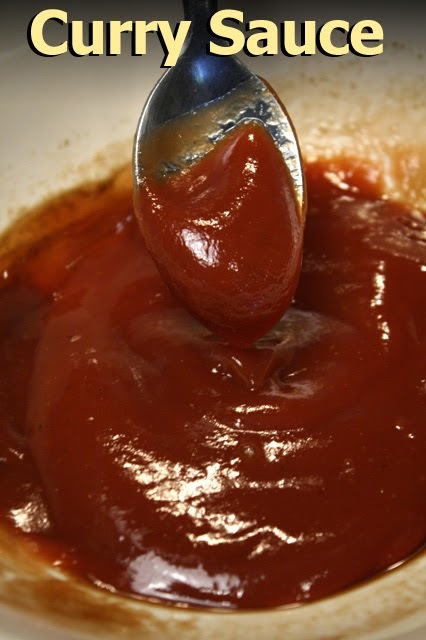 You can also mix all sauce ingredients, then heat in the microwave. Remove sausage and slice it on a plate. 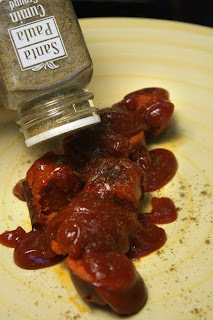 Pour heated sauce over sausage; and sprinkle 1/2 teaspoon of ground cumin over plated Currywurst. Get out the toothpicks, pour a stein of Pilsner, and serve with bread or Belgian Fries -- to soak up the deliciously pungent sauce. Be a fly on the restaurant wall for Restaurant Nocturnes VII, by The 99 Cent Chef. Buzz around Los Angeles to see and hear, from the maitre d's, waiters and customers themselves, what's on the menu during nighttime grazing hours. 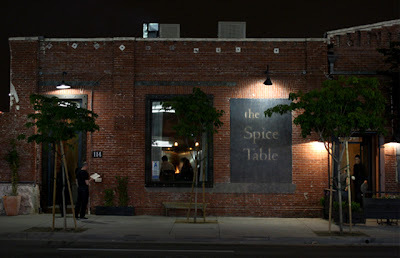 This moveable feast takes you from the latest hip downtown spot, Spice Table, for Grilled Lamb Belly Satay, and to South L.A. for the best down-home BBQ ribs, found at Phillips -- were you are served, literally, through a hole in the wall (okay, it's a sliding glass window). No cafe is too high-class or declasse for this culinary camera-sleuth. 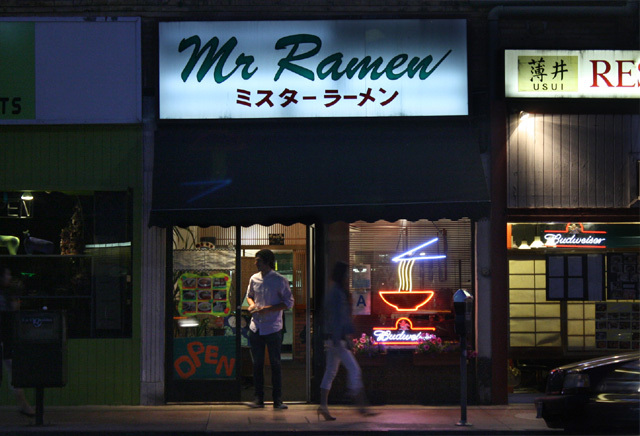 I like nothing better than turning a city block corner to discover a cool unheralded eatery like the neon-lit Mr. Ramen -- the name says it all. Your ears will delight to waiters' descriptions of cutting-edge cuisine, as well as classic comfort food. You'll even eavesdrop on The 99 Cent Chef taking language lessons from a fraulein at Berlin Currywurst -- you just try pronouncing Scharfe Kasewurst sometime! If you're a raw foodie, just listen to the gourmet goodies served at vegan restaurant Cru (where it's BYOB, with no corkage), in vegetarian friendly Silverlake. 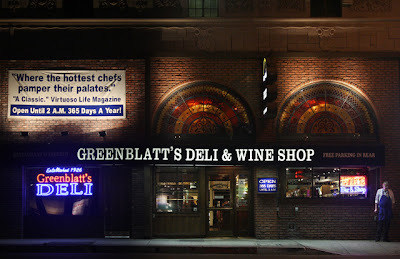 Or if it's a stacked, juicy, Roast Beef sandwich you crave, then rub the ghostly elbows of F. Scott Fitzgerald, Billie Holiday or Lenny Bruce at the oldest deli on Sunset Boulevard, Greenblatt's, serving swells since 1926. To have your sweet tooth satiated, make sure to stop for a Lemon Meringue slice at the House of Pies in Los Feliz -- and hear the waitress give a rundown of a dozen luscious confections. So clear the table and let The 99 Cent Chef serve a 16 course video selection of the sights and sounds of Los Angeles nighttime gastronomy. Play it here. The video runs 4 minutes, 20 seconds. Restaurants in order of appearance - click on a name to see their website (or review), along with my original Twitpic link. Restaurant Nocturnes I, Restaurant Nocturnes II, Restaurant Nocturnes III, Restaurant Nocturnes IV, Restaurant Nocturnes V, Restaurant Nocturnes VI. 99 thanks to the restaurant owners, managers, hosts, chefs, waiters, bartenders, busboys (or girls) and patrons. Free is better than 99 cents any day. And the main ingredients in this week's recipe proves it! 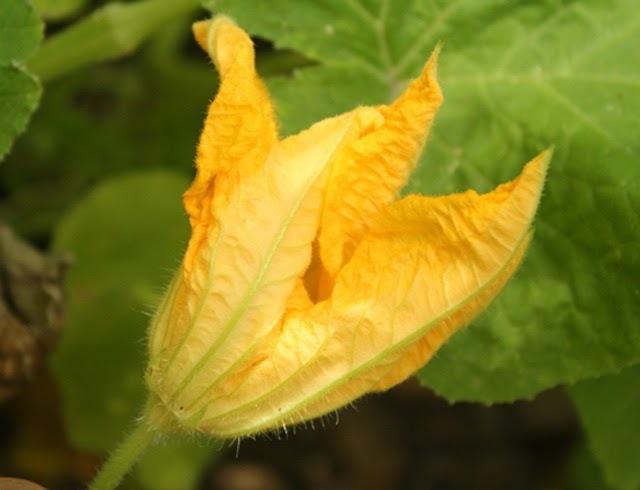 Squash plants with bright yellow blossoms are everywhere in my small garden this summer, and I didn't pay a cent for the plants. All year I compost my veggie scraps in a 4 by 4 foot square of dirt. By the Spring I have enough rich earth to replenish my fallow garden. One of the problems, or in this case, benefits, are the compost seeds that sprout everywhere. Usually it's just some tomato plants, but this year squash plants have sprung up everywhere. 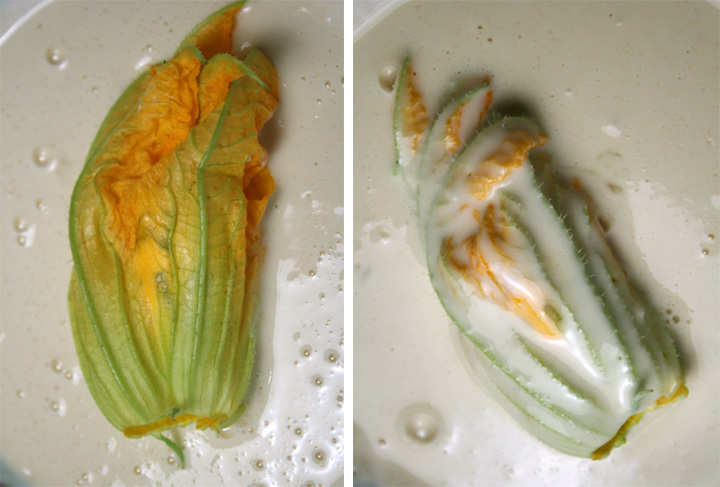 When one is given lemons, you make lemonade -- or in this case, when you get squash blossoms, make Stuffed Squash Blossoms with Herbs & Cheese. I am also getting a bumper crop of herbs. 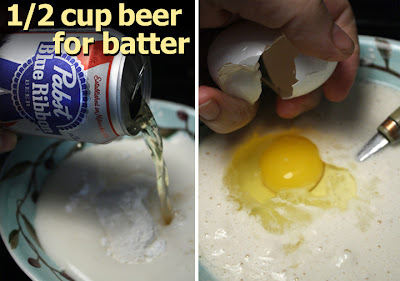 So the only main expense was a small tub of Cream Cheese, and half a can of PBR (cheap beer) from my local 99c only Store. I always have eggs and flour around. This delicate dish uses a light batter for frying, so the tender and mild squash flavor comes through. Surprisingly, the squash flowers hold up quite well to frying. And the herb-studded cheese is a scrumptious creamy bite. 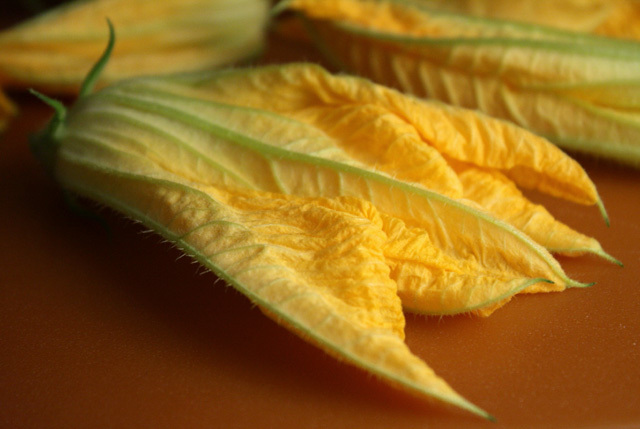 You don't need a lot of cash for The 99 Cent Chefs latest high-end recipe -- just some free garden squash blossoms, herbs, and a light sauteing touch. 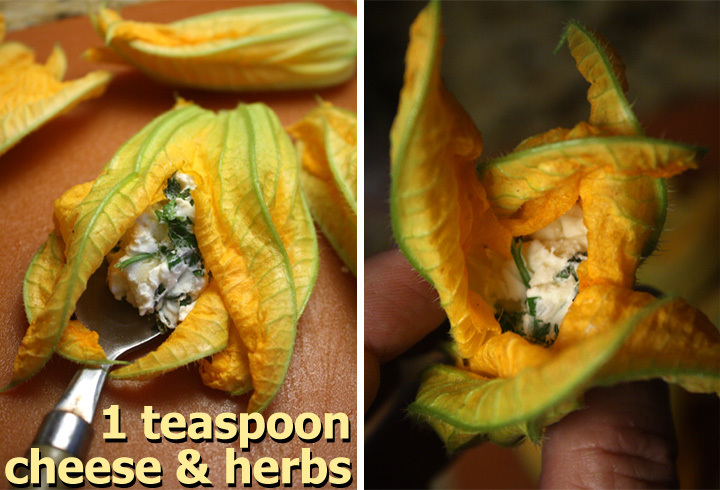 For all you gardeners out there, this recipe is for you. 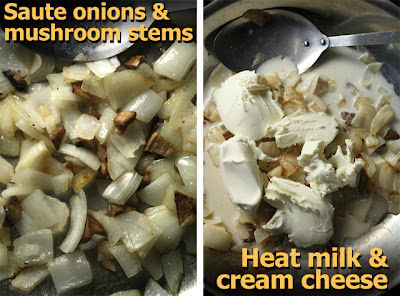 1/2 small container of cream cheese, ricotta, or any favorite cheese -- soft or shredded. Handful of chopped herbs - I used parsley, oregano and sage from my garden. Okay to use a 1/2 teaspoon of dried. 1/4 cup of oil - just enough to cover the bottom of your frying pan. A tasty addition would be to add some sauteed and chopped soft mushrooms into the cheese mixture. Allow cheese to reach room temperature. 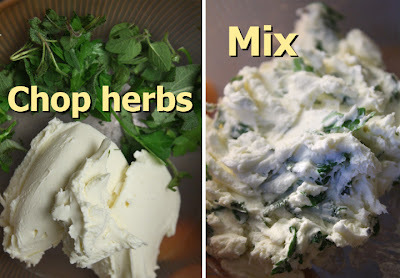 Chop herbs and mix into softened cheese. If you use a harder cheese like cheddar then grate it and mix with herbs. Cut off long stems of squash blossoms, but stop at green base. Be careful not to clip a hole into bottom - you don't want melting cheese to leak out too much. Stuff each blossom with about a teaspoon of cheese mixture, depending on the size of each squash blossom. Mix all the batter ingredients in a shallow bowl for dipping the Stuffed Squash Blossoms. 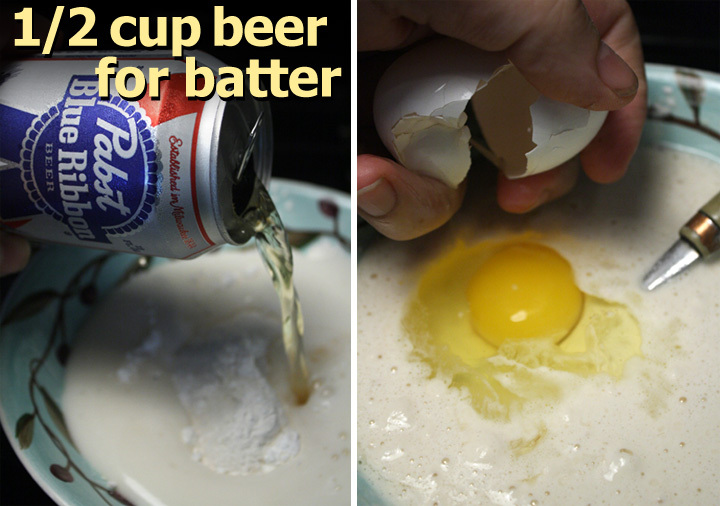 It should be thinner than pancake batter. You are going for a light coating, it can be on the thin side. It's all about tasting the delicate blossoms. The batter coating will help hold in the melting cheese/herb stuffing. Next add veggie oil to sauteing pan or pot, over medium/low heat. Test heat oil in pan with a drop of batter -- it should bubble and fry when added. 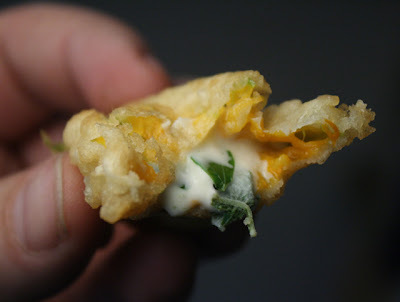 Dip Stuffed Squash Blossom into batter, coating all sides. 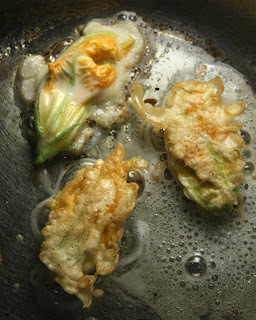 Pick up coated blossom and let excess batter drain off; then add each Stuffed Squash Blossom into pan as you coat them. This dish combines well as a topping for a favorite pasta entree, like my John Cassavetes Red Pepper, Olive Oil, Garlic & Pasta; Fettuccine Alfredo; or Spaghetti alla Carbonara with Bacon Bits -- just click on a name for the recipe. 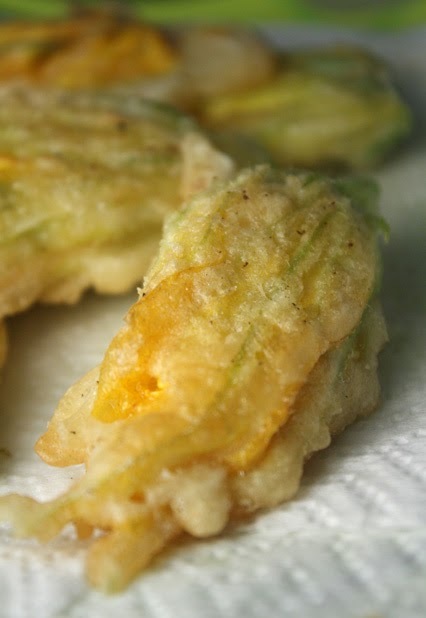 Stuffed Squash Blossoms also make impressive party hors d'oeuvres. Miss Patti has been deep in the L.A. music scene over the years -- booking gigs for the likes of bluesy King Cotton and Morris Tepper, and guesting on local roots radio programs. Miss Patti has influenced L.A. music tastes, and now she tickles the taste buds of The 99 Cent Chef's audience. I first met Ms. Patti at the The Palomino Club, the North Hollywood country, rockabilly and cow-punk venue (closed in 1995) where she performed with her group Ironin' Maidens (along with Melba Toast). The Palomino Club was a classic Valley roadhouse with a couple of pool tables on one end, a stage on the other, and a bar in the middle. Ms. Patti moved to Slidell, Louisiana some years before Katrina hit. With a menagerie of critters in her back yard including cats, dogs and two mules named Fellini and Fidel -- you can be sure no little piggies were put under for her vegetarian version of Red Beans & Rice. Miss Patti loves her animals and does not eat meat. She still comes back to L.A. when she can - I'm catching up with her in Burbank tonight (Friday) at Viva Cantina, where King Cotton is performing at 10:30 p.m. (an earlier act, Cody Bryant, starts around 8:15 p.m.), and the show is free. Last Sunday I roped and corralled her in my kitchen, and put her to work rattling my pots and pans! Her Red Beans & Rice is easy to make, just add some chopped veggies and the beans, with salt and pepper, to a pot of boiling water, and cook until desired tenderness. As for rice, she prefers Basmati. 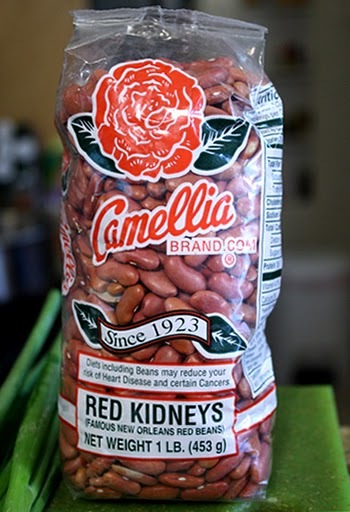 I always find one pound bags of off-brand red beans at my local 99 cent Only Store, along with Jasmine and long grain rice. You can substitute, as these ingredients are cheap from any grocery. The fireworks fly and zingers abound when Ms. Patti is on the scene! 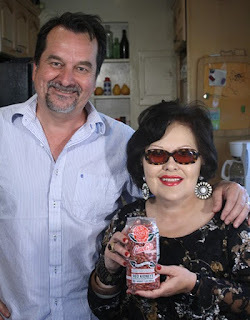 So sit back and watch The 99 Cent Chef's latest video recipe, where Ms. Patti shows me, and you, a thing or two. Play it here. The video runs 3 minutes, 30 seconds. 8-10 cups of water - follow package directions. Salt and pepper to taste -- add a tablespoon of your favorite Creole spices for extra flavor. 2 cups of rice - follow package directions. 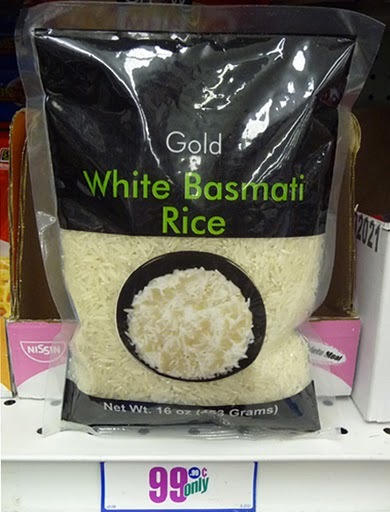 Miss Patti like Basmati rice, but I've made the recipe with regular, brown, or even instant, rice. Add 8-10 cups of water to a large pot. To speed up cooking, first soak beans overnight. 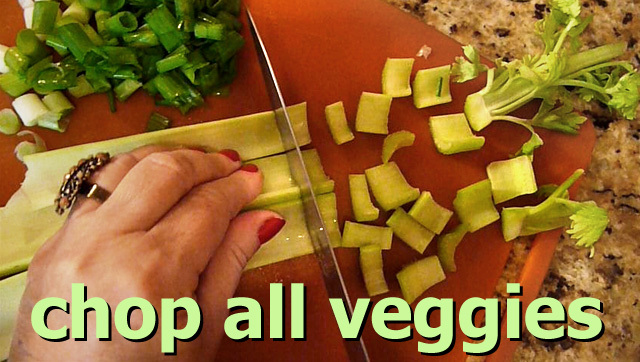 Bring water to a boil, while roughly chopping onion, bell pepper, celery and green onions. Add veggies to water with beans. Season with salt and pepper (plus Creole spices, optional) to taste. Cover pot and cook, to quote Miss Patti, "depending on how firm or soft you like your beans." 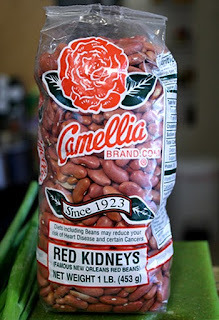 This can mean 2 (if you soak beans overnight) to 4 hours (straight from package). 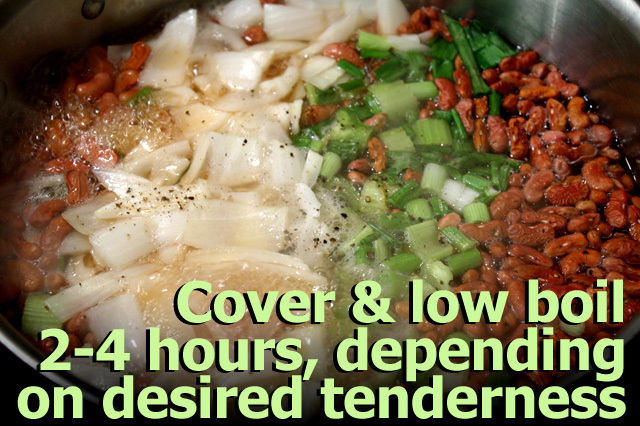 I like to remove cover for the last half hour, or so, and allow the bean broth to cook down and thicken. (I like a gravy-like broth instead of a soupy one.) 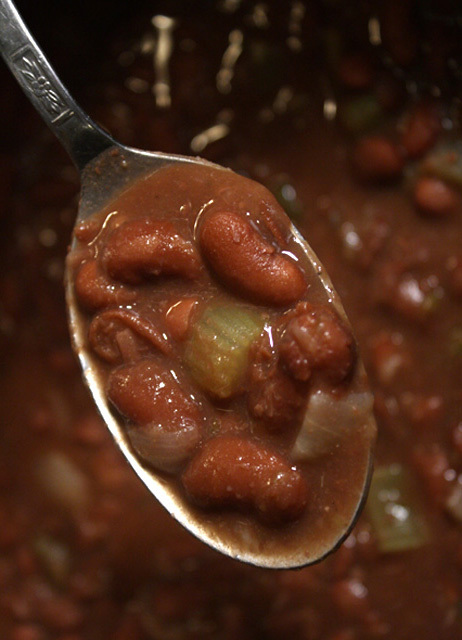 Check on the beans from time to time to make sure liquid doesn't cook out. It's easy enough to add half a cup of water, when needed. During the last half hour, start the rice and cook to package directions. I let the cooked rice sit covered for 5 minutes, before serving. 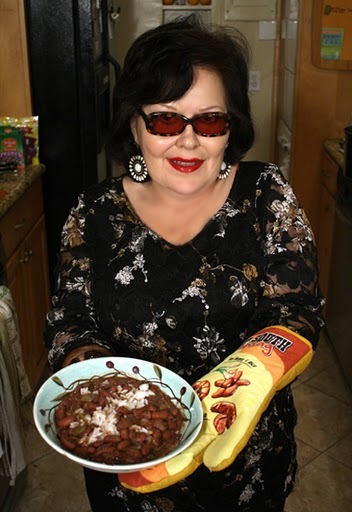 Add rice to plate, or bowl, and top with Ms. Patti's Red Beans, and don't forget to get out the hot sauce! If you like pesto, which is typically made with pine nuts, then let's cut out all the other ingredients and get busy with a more intensely flavorful nut, the cashew. Pasta just goes well with nuts. It's best to toast them for a couple of minutes in some olive oil to bring out their rich flavor. 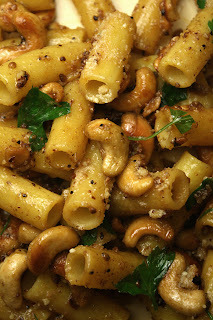 My cashew pasta dish is quick to make, but does not skimp on taste. 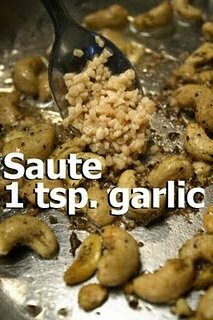 Even adding a teaspoon of garlic to the pan does not overpower the cashews. 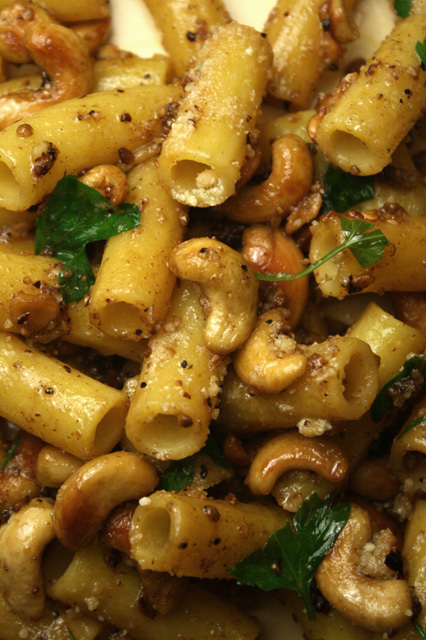 All you need is a small bag of cashews to make one hearty pasta serving. I get mine at The 99 cent Only Store, but you could buy them anywhere -- from the local liquor store, to your favorite grocery chain; and it will be as cheap as sausage or any other protein. 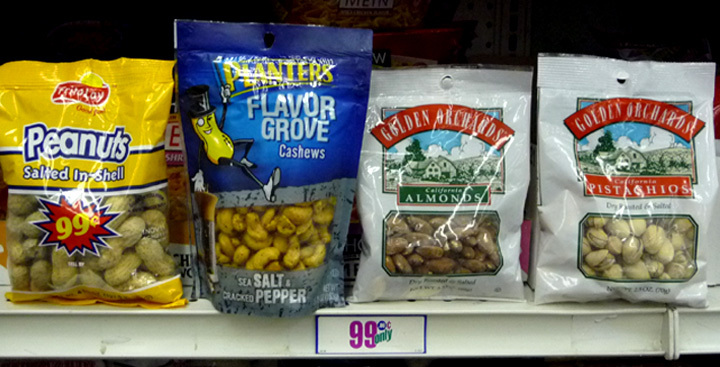 If the package of cashews are spicy or salty, that's even better! If you want to keep it low sodium, then give the nuts a quick rinse and pat dry. You can also substitute any favorite nut, like peanuts, almonds, pecans or pistachios. You will want to shake off and remove the scales that cover some nut types. Don't worry about removing every crumb. 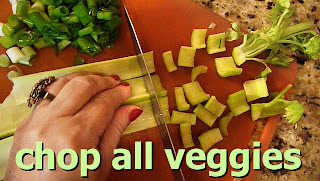 If nuts are extra large, just give them a rough chopping -- leave a few whole, for presentation. 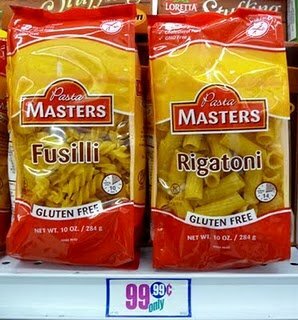 And pasta is cheap anywhere. You can cook your favorite type. I found some gluten free rigatoni, so I gave it a go -- seemed fine to me, I couldn't tell the difference for a first tryout. So for a filling vegetarian entree try out my latest Italian pasta creation, Pasta with Cashews & Garlic. 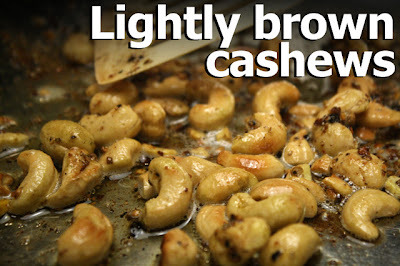 Roasted cashews - about 3 ounces, or 1/2 to 3/4 cup. Or any favorite nuts. 1 tablespoon dried parmesan cheese - okay to use fresh shaved parmesan. 2 tablespoons of olive oil - or a favorite flavorful oil. Season to taste - if nuts are salted, then just add pepper to taste. Any fresh garden herb (optional) -- okay to use a pinch of dried Italian herbs. 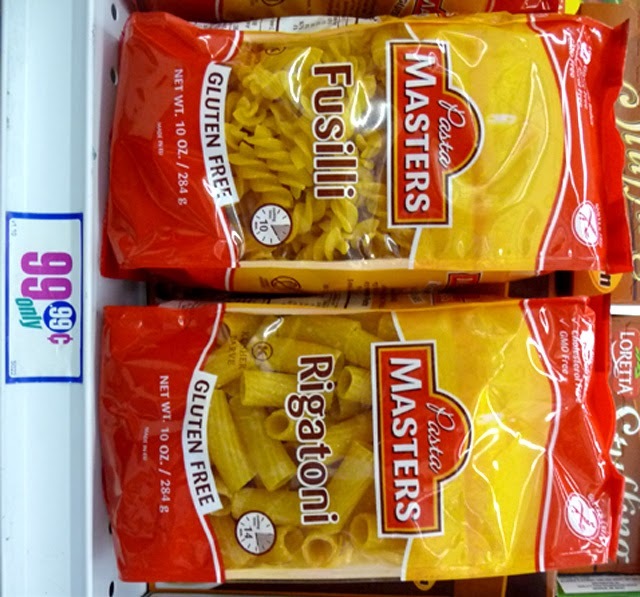 1/2 package of pasta (about 8 ounces) - any you have on hand. I used rigatoni. 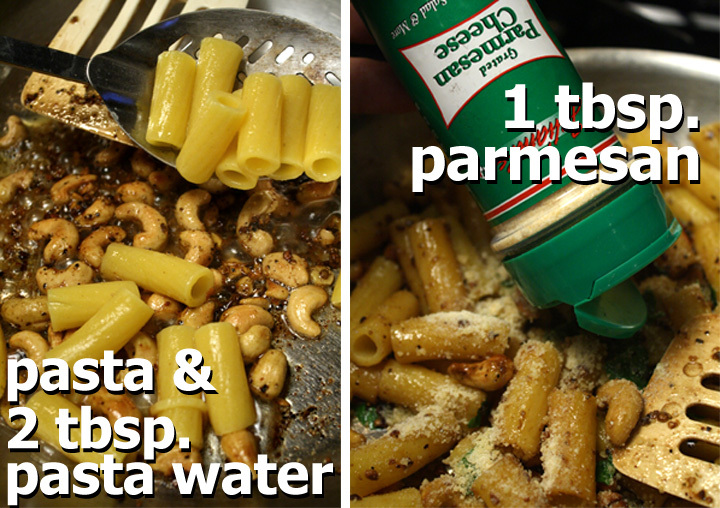 In a pot, add pasta to water and start boiling -- follow package directions. I usually shave off a minute or two for al dente. Over medium heat, add oil to a large frying pan. Add cashews, stir and heat through for two to four minutes - until cashews just start to lightly brown. Reduce heat to low, add garlic and stir another minute -- or until pasta is done (you can also precook pasta.) 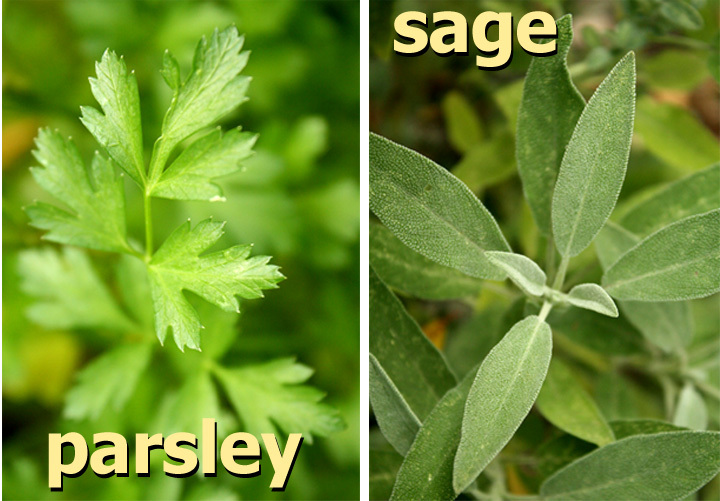 Sprinkle on herbs and pepper (salt if necessary.) I have a crazy amount of garden parsley, so I used a handful of it. Scoop out pasta from pot directly to the pan of sauteing cashews and garlic (if pan is big enough). Add a couple of tablespoons of pasta water, and one tablespoon of dried parmesan cheese. Mix well and serve. 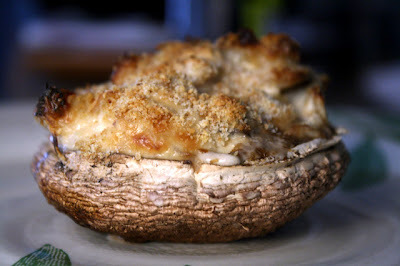 I am on a Portabella mushroom kick, just click on these delicious recipe links: Mushroom Burger and Portabella Crab Rockefeller. Now you can add Stuffed Portabella with Chicken & Cream Cheese to the list. This luscious entree is easy to do, and man is it tasty. 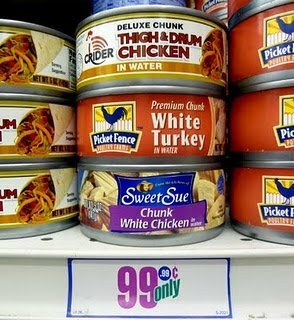 I've been using canned chicken lately for the convenience - it's a nice change from canned tuna and is about the same price. 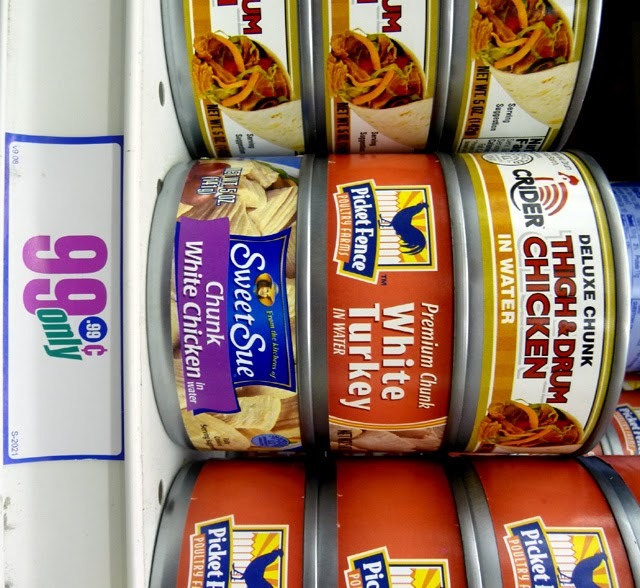 Now 99.99 cents for 5 ounces doesn't compare to my usual 59 cents per pound leg quarters meat, or 99 cent per pound breast meat sales, but sometimes there is not time for defrosting then cooking it. I've topped a 2 Minuted Salad with canned chicken; and made Chicken Pita Sandwiches for a Hollywood Forever Cemetery movie night picnic. If your pasta dish is looking anemic, just add a small can of poultry. 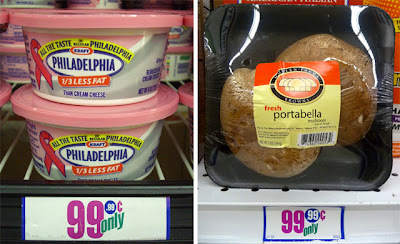 The ingredients were all bought at my local 99c only Store, including cream cheese and portabella mushrooms - just yesterday I saw portabellas at the Hollywood one. If your local market charges too much for a portabella, then substitute with bell peppers, large tomatoes (hollowed out), or stuff into baked potato skins. My chicken and cream cheese sauce goes well in most any baked veggie. This recession proof dish is impressive enough to serve on a first date, just don't admit you used dollar store ingredients! At the end of my directions, I also feature an easy way to make your own cheap breakcrumbs*. 1 small can of chicken or turkey - about 5 ounces, drain water. *Tablespoon of bread crumbs to top each mushroom - optional. Remove mushroom stems and chop. Add chopped onions and mushroom stems to an oiled saute pan. Cook about 5-10 minutes until onions are soft. Add milk and cream cheese. Allow to melt and mix well. Drain and add canned chicken or turkey. 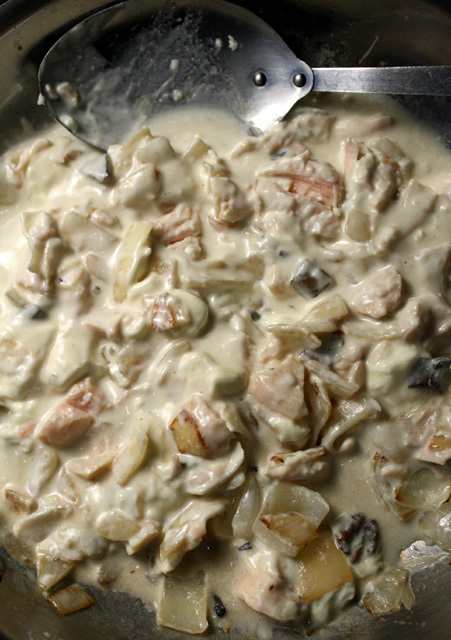 Mix well but try to leave some of the chicken in chunks. Salt and pepper to taste. 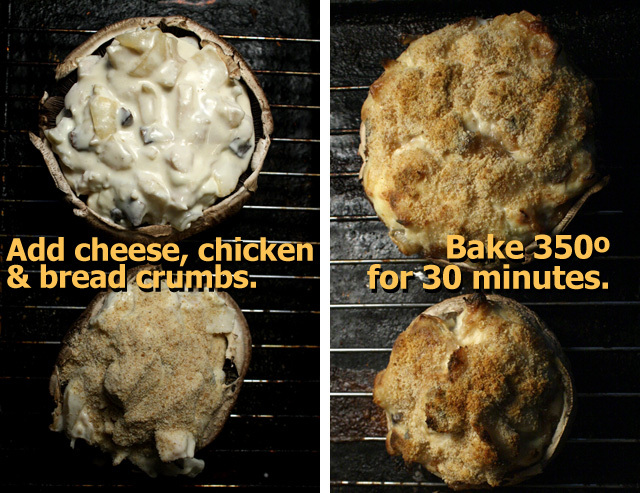 To assemble, place each mushroom on a baking sheet or on a wire rack. First add cream sauce with chicken (it's okay to pile on the sauce), then top with bread crumbs. Bake in a preheated 350 oven for about 30 minutes. 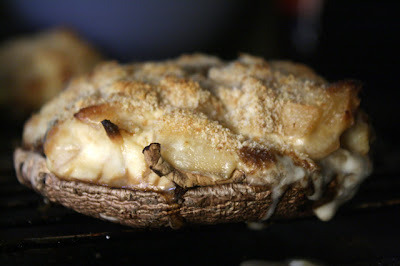 Done when bread crumbs brown and portabella mushroom is tender. *To make your own dried breadcrumbs, bake a few slices of white or wheat bread in a 350 degree oven for about 15 - 20 minutes until dried out. Check during the last five minutes to make sure the bread does not burn. Turn the bread slice over, half way through baking. Remove from oven and allow to cool for a couple of minutes; then add to a blender or food processor (or place in a plastic bag and crumble with a rolling pin, wine bottle or large glass). Pulse slices until fine like sea salt. Extra bread crumbs store in the refrigerator for a long time. May need to microwave for a minute when reusing. For extra flavor season the bread slices with salt, pepper, dried parmesan, and any favorite fresh or dried herbs.